Saturday may have been the luckiest day of the year for IndyCar fans, at least in terms of weather. The forecast looked hopeless during parts of the day, and fans who were trackside swore it would be a washout. However, quite the opposite turned out to be true: despite a brief shower causing a 20 minute red flag, we were given a fantastic show, and some of the best racing I’ve seen all year. As soon as the green flag dropped, a spectacular show began consisting of the nail-biting, on edge racing that we know and love. Growing up, it was this sort of racing that I enjoyed at tracks like Texas Motor Speedway and Kentucky Speedway. Though the race at Texas seems to have lost its luster in recent years, and Kentucky is non-existent in the IndyCar series, Iowa hasn’t changed a bit. If the exciting on-track action weren’t enough, last night’s race also showed a mix of familiar and unfamiliar faces up front. The majority of the race featured a Penske/Ganassi shoot-out, with a dominating Tony Kanaan in the lead. However, the IndyCar world seemed to put that action on hold as Sebastian Saavedra charged from 17th to the top three. The excitement was short-lived, as he brushed the wall, suffered suspension damage, and eventually retired early from the race. Saavedra has certainly had his share of ups and downs this season, but the fan-friendly Colombian seems to be slowly improving with his increasing years of experience. For the first time all season, this year’s stellar, highly praised class of rookies all displayed shades of inexperience. Hawksworth and Huertas ran multiple laps down, before Huertas eventually parked it early. Munoz, despite his 5th place start and fearless reputation, struggled to stay on the lead lap all night. In the words of our broadcasters, Aleshin made “the first mistake on an oval this year,” as he lost control of his car on a restart, collecting Takuma Sato. This second incident between Aleshin and Sato once again brought out the mouthy side of owner and legend, Mr. Foyt (which, unlike others, I found unnecessary and distasteful). However, the last ten laps, following the clean-up for Andretti’s second engine failure of the season, were undoubtedly the highlight of the night. Fans kept a close eye on the Penske/Ganassi shoot-out, expecting to seen Kanaan in victory lane. But before we knew it, both Ryan Hunter-Reay and Josef Newgarden, after running mid-pack most of the night, came charging to the front out of nowhere. 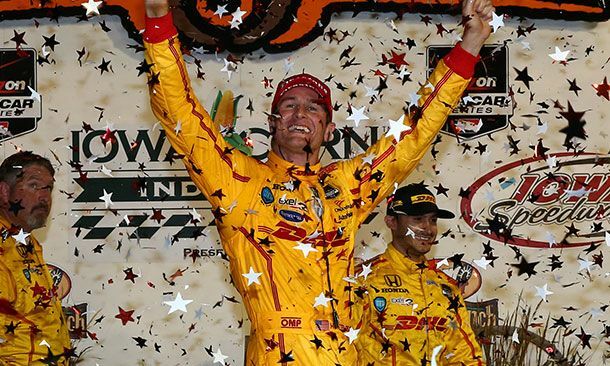 Everyone had all but assumed that Andretti Autosport’s four-year winning streak had come to an end, until Hunter-Reay breezed by Kanaan, seemingly with ease. The last ten laps left fans jaw-dropped, wondering how and where Ryan came from to take the checkered flag. What turned into a near disaster of a night for Andretti Autosport was redeemed by a near miraculous turnaround from Ryan Hunter-Reay. The IndyCar event at Iowa Speedway has been on my bucket list for years. Since I’ve been a fan, the action at this track has been intense and thrilling from start to finish. At the conclusion of the last ten laps, once I put together what had actually happened, I was a proud IndyCar fan, knowing that this sort of intense racing action has quickly become a norm. Previous Previous post: By 2016 will IndyCar no longer be Ovalating?